"My art is figure-focused, as I love observing people; from the personal interaction to the study and love of the human form ... Trying to change the boundary between illustration and what art is considered fine or high has become a key to my art. I feel the terms are outmoded and in need of redefinition. While I don’t have the right answer, I feel obligated to shake up the concept in the pursuit of my message." 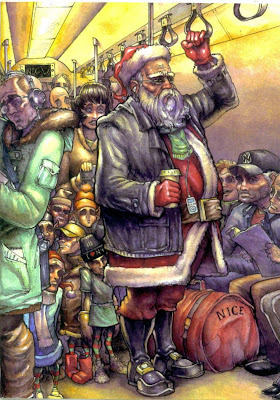 Shown here is one of his New York Xmas perceptions.